The Dodge compact van offers you a load capacity of 213 cubic feet. This is up to 43 more cubic feet of space than you can get in some other vehicles of the same type. And just as important is a big payload margin over most competition. Ad additional advantage is wider cargo doors, both rear and side. The number of cargo-door-arrangement variations the Dodge compact van offers you is unexcelled (see next page). Dodge is the only compact truck with a full-foam, bucket-style seat as standard equipment. With all its superior mechanical advantages combined with a very competitive price, it is the greatest value you can find in a compact van. FINEST QUALITY SEATS – There is no burlap, jute or cotton padding in Dodge compact truck front seats. They’re made of Bostrom, and they’re full polyurethane foam moulded over a rugged spring-frame assembly. More than that, they’re of bucket-seat design, built to cradle the rider gently and comfortable all day long, and are covered with a tough, attractive black vinyl material. DIMENSIONS AND CAPACITIES – The Dodge compact van exceeds its competition in load space. 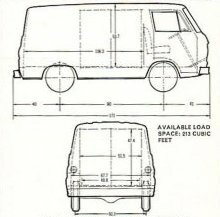 The illustration and dimensions below will show you how much room the Dodge compact van gives you. 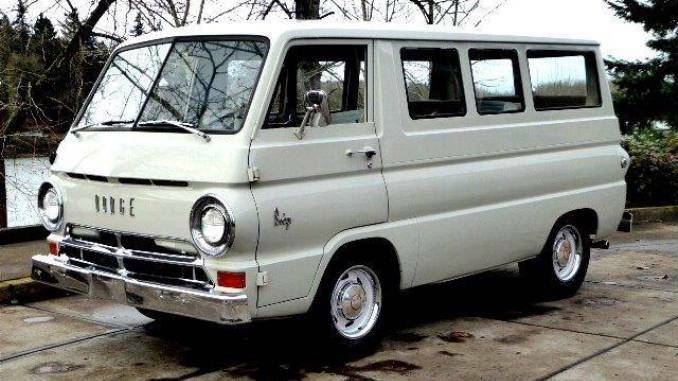 3800-POUND GVW with a payload capacity of 900 (front axle rating, 2200 pounds; rear axle rating, 3000 pounds) is standard on the Dodge A100 Van. 4600-POUND GVW – To increase GVW to 4600 lbs. (and payload to 1635. ), 6.70 x 15-4 PR tires mounted on 15 x 5.00 wheels are recommended. 5200-POUND GVW – The 5200-lb. GVW equipment (payload, 2110 pounds) comes in a separate package and includes these components: stabilizer bar, body channel reinforcement, 10″ clutch, heavy-duty manual (or LoadFlite automatic at extra cost) transmission, 3600-lb.-capacity rear axle (3.91 ratio), 2500-lb. front axle with 11″ x 2.75″ front brakes, 1100-lb. front springs, 1410-lb. rear springs, 7.10 x 15-6 PR tires mounted on 15 x 5.00 wheels. Either the 101 hp Six, 140 hp Six, or 174 hp Dodge V8 engine may be used. 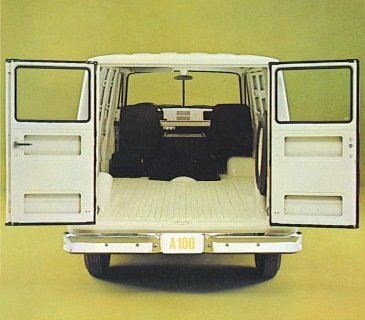 DOOR OPTIONS – Your Dodge A100 van may be ordered with doors on the rear and right side only – or on the rear, right and left sides – and with any of the window options described below. And these doors are interchangeable. WINDOW OPTIONS – Rear doors are available without windows – with fixed windows – or with vented windows hinged at the top. Right side doors are available without windows – or with fixed windows. Left side doors are available the same way. In addition, “Vision Van Curb Side” and “Vision Van” options make it possible to get windows the full length of the right side or the full length of both right and left sides. 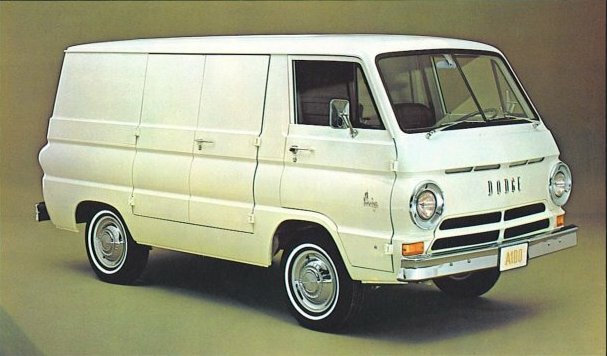 DODGE A100 COMPACT PANEL VAN – This model is dimensional identical to all other Dodge compact van models. The only difference between it and them is that the Panel Van has rear doors only and is not available with doors on either the right or left side. The van custom package includes a cigar lighter; coat hooks; bright horn ring; bright finish hubcaps; cab compartment interior insulation; sun visor, right side; cargo compartment headlining. All equipment in the custom package except coat hooks and cab compartment interior insulation is available as a separate option.